GDP per capita provides, at best, a rough clue of standard of living. And Buffett’s line about the qualities that “propelled us forward” gave me pause. This gives the impression Warren Buffett does not recognize the extent we’ve plundered our own continent (and much of the rest of the world). Perhaps the “qualities” he had in mind were all related to values and character. Two critical qualities we had in 1930 but don’t have today are a sustainable level of population and a healthy amount of natural capital. Unfortunately, U.S. population has soared from 123 million to 325 million, and we’ve been liquidating natural capital at an ever faster, unsustainable rate. I bestow this “honor” reluctantly, for there has always been a lot to like about Buffett. He is very open about how he benefits from, and we need to change, a tax code that favors the one percent. He also still lives in the modest (by billionaire standards) house in Omaha that he purchased for $31,500 in 1958. Unfortunately, he does travel in a private jet and reportedly owns a $4 billion mansion in Laguna Beach. I don’t consider these positive attributes because the planet cannot support 7 billion people flying private jets and occupying multiple, large houses. But he has also pledged to give away the lion’s share of his wealth philanthropically. So, in spite of his preoccupation with GDP (which measures destruction as much as productive economic activity, and is a very poor indicator of true prosperity), the third richest person in the world gets a nod of approval from me even as I give him two thumbs down for ignoring limits to growth. You are quite right to fault Buffett for what amounts to willful ignorance. Hillary Clinton is also willfully ignorant, as demonstrated by her treatment of the essay written by Bindi Irwin. It may be a character flaw, but I have more tolerance for straight stupidity than willful ignorance. 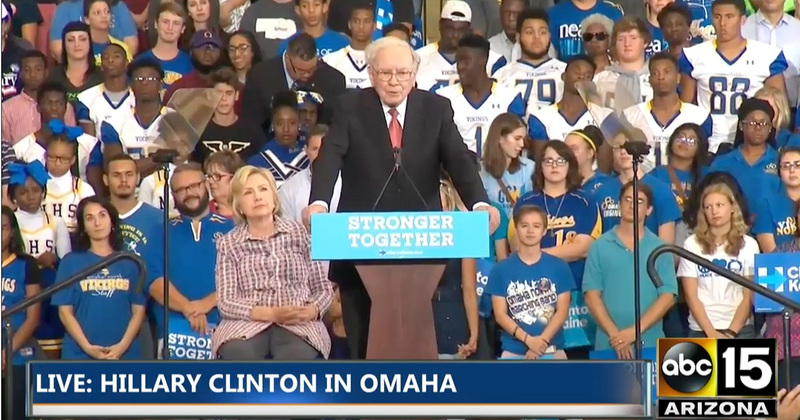 You hate to fault Warren Buffett for expressing optimism about our country, but I would be a lot more optimistic if someone with Buffett’s stature would tell us the truth about the unsustainability of our predilection for perpetual growth (both economic and population).